This photo was too funny not to share and ask for help with a caption. Jamisen was rather startled to be handed to a giant green Grinch but, rest assured, Chris and I were right there to cheer him on. Apparently, our cheering? Not so motivating as evidenced by the look on his face. Got any great ideas for a caption!? Wait!? What the?! You are not leaving me here, are you? “I feel so used for your amusement” he he great picture and such a cutie!! Caption: How the Grinch Stole Baby! Priceless expression, have a great holiday. Seriously, Mom…no more peas before bedtime! I due mostri di bontà! I am torn between “The Grinch That Stole Jamisen” or “I knew Santa was an alien!” That pic is adorable. My husband says “The Reason For The Season”. Happy Holidays!!! Oh too cute and funny! He’s going to meet Santa on Sunday and we can’t wait! That’s hysterical. 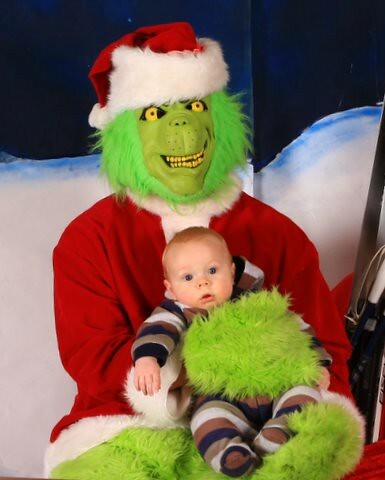 Poor Jamisen – I sympathize with his expression (that grinch looks a little creepy).